Structured and unstructured data is constantly growing, data retention requirements and user access requirements are continuously changing, and the demand for the readiness and availability of business systems and data becomes even higher. The use of content management systems is vital and necessary; it is what makes an organization's success viable. The availability of these systems is of crucial importance. Several technologies of various degrees have provided an answer to backup, availability, and disaster recovery requirements, but all at a price. How can you achieve maximum availability of your IBM DB2 Content Manager systems while balancing costs, resources, and skills? 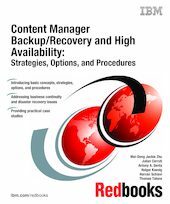 The purpose of this IBM Redbooks publication is to introduce the concepts of backup/recovery, high availability, and disaster recovery for Content Manager systems, and provide strategies, options and implementation steps to protect your Content Manager systems. We also explore, through various case studies, how to apply your newly gained knowledge to real-world Content Manager system implementation and practices. This book will also help IT architects, specialists, project managers, and decision makers identify the best high availability and disaster recovery strategies and integrate them into the Content Manager solution design process.